To call Let it Die a hack-and-slash would be a disservice. In my time with Grasshopper Manufacturer's latest psychedelic brain-buster, I did my fair share of hacking and slashing, but there was also a healthy amount chainsawing, grenade throwing, and more running around in my underpants than I care to admit. That last bit didn’t come as much of a surprise considering that this is, through and through, a Suda51 jam. Death is literally your tour guide as you wander your way through a crumbling, carnival-themed tower. He periodically pops up, wearing 3D glasses, to compliment your bravery and give you tips on how to survive encounters with the tower’s inhabitants; grotesque mutants, who just so happen to be the results of some twisted experiments and are currently out for your blood. The opening of the demo had me equipped with nothing but bare knuckles and my skivvies, so I went with a stealth approach, sneaking up on the tower’s bandits until I eventually found a bat and some pants. This made surviving encounters in the tower a little easier. Emboldened by my new pants, I began tackling encounters head-on. The combat feels like a more forgiving version of Dark Souls. You utilize dodge and parry mechanics to get a leg up on foes, and one of six weapon slots create real carnage. I opted for a baseball bat and chainsaw combo (one in each hand) and only managed to get myself killed a couple of times. It introduces Let it Die’s roguelike influence. Despite the developer’s hesitance to officially label it as such, you’re only given three continues before you lose all your gear and wake up in your underoos. Again. The demo was short, but left an impression. It’s certainly a departure from Grasshopper Manufacture’s previous efforts, but maintains the off-the-wall charm and completely bonkers aesthetic that are synonymous with Suda51 and his team. 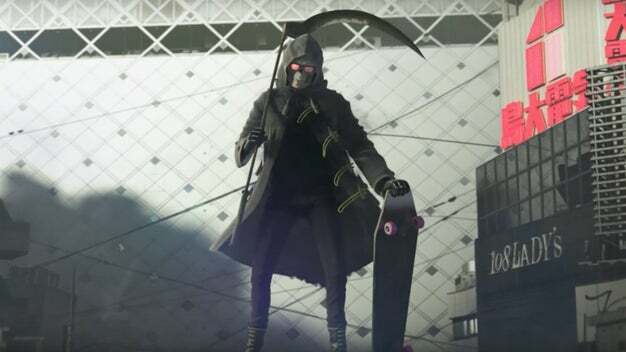 With it’s myriad weapons and branching paths, Let it Die looks like it will offer plenty of variety when it hits PlayStation 4 later this year.